DESCRIPTION LEGENDARY home of the CANADIAN HORSE RACING HALL of FAME "HORSEMAN" on 40 potentially SUB-DIVIDABLE ACRES! A COMPLETE TURN KEY BREEDING CENTRE w/ 7410 sq ft, 29 HEATED STALLS w/CONCRETE floors w/rubber mats w/BARN OFFICE, LAUNDRY + 3 pce bath, 23 turnout paddocks all w/SHELTERS + 9 w/AUTOMATIC WATERERS, ALL STEEL PADDOCKS (no repair required), LARGE MACHINE SHED, feed shed, 2 WELLS pumping 20 + 13 GPM! PAVED DRIVEWAY + access, NEW HALF MILE DIRT TRAINING TRACK, PARK-LIKE setting w/MATURE TREES, VOLLEY BALL court + INCREDIBLE VIEWS! Over 4877 sq ft of developed living space within 2 HOMES...1.5 storey FULLY DEVELOPED w/5 bdrms, 3.5 baths, neutral decor + FRESHLY painted SIDING + WINDOWS, DOUBLE O/S attached + HEATED garage w/LOFT! Plus 1211 sq ft 3 bdrm mobile home w/2 4 pce baths. Located only a few km's to CALGARY + OKOTOKS. ONLY 30 mins to CENTURY DOWNS RACE TRACK + CASINO, + EASY CITY access! FANTASTIC BROOMARE, RACE HORSE TRAINING + EQUESTRIAN SET UP! This ONE of a KIND property is the REAL DEAL!!! Home for sale at 276156 32 ST E Rural Foothills County, Alberts T0L 0X0. 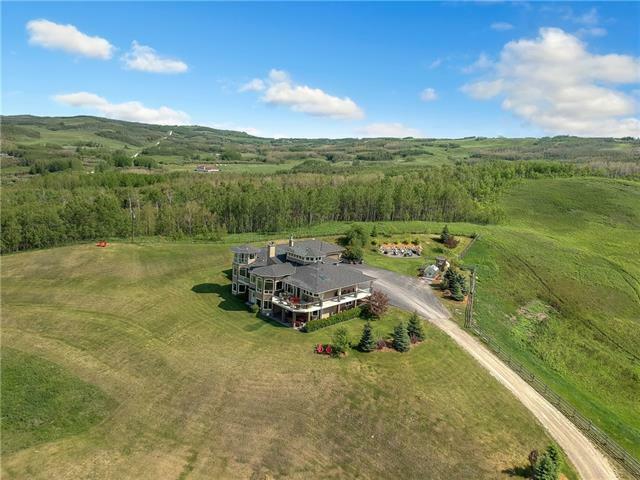 Description: The home at 276156 32 ST E Rural Foothills County, Alberta T0L 0X0 with the MLS® Number C1025781 is currently listed at $2,495,000.